It is strongly recommended to download any program from official websites; this will help you avoid getting infected with malicious software. Linux distributions, including Kali Linux, are not exceptions; so they also need to be downloaded only from official websites. This ensures the absence of Trojan and virus programs, and will also allow you to get the latest software versions. Kali Linux is used for penetration testing and forensic examinations. Being a professional penetration tester or forensic expert, you must be absolutely sure of the integrity of your tools. If your tools are not trustworthy, then the results of your research are also not credible. Even if your standards are not so high, it is still highly recommended to follow the steps described here, since not genuine versions of the software can intentionally or unintentionally cause serious harm. These sites cannot be accessed without the use of SSL, which significantly hampers the man-in-the middle attack, and thus reduces the danger of getting what you do not want to get. Which Kali Linux Image should I download? However, even for installation in a virtual machine, I prefer to download regular ISO images, as this gives me more options for fine-tuning the system. Kali Linux images divided into 64-bit and 32-bit versions. 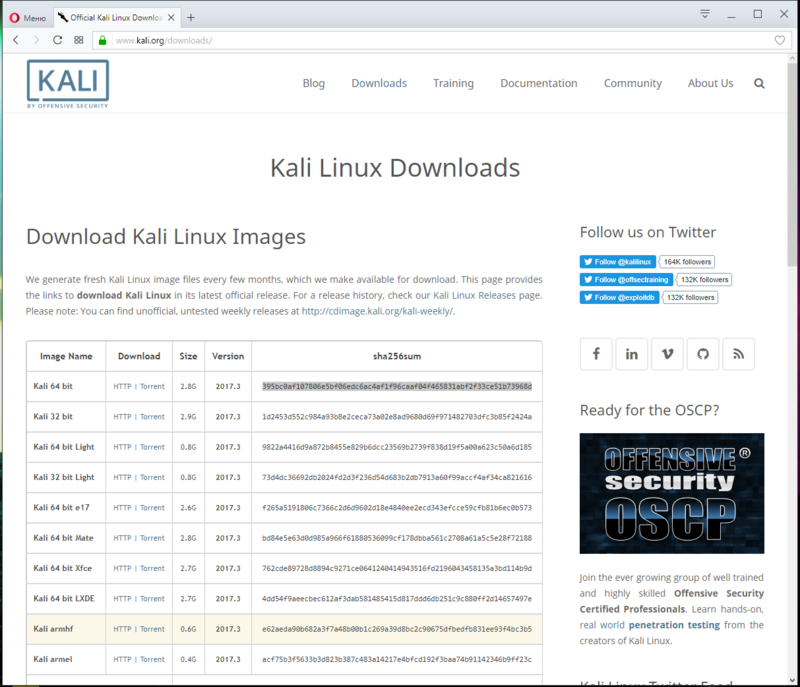 Kali Linux images differ in the desktop environment. Also there is a lightweight system, with a minimum set of programs - Light. For most modern computers, 64-bit systems are suitable. If you want the classic look of Kali Linux, the one that is on most screenshots and video on the Internet, then download the image of Kali 64 bit or Kali 32 bit. In this case, you will have GNOME 3 as the desktop environment. If you want a more classic look, then select the version with Mate. If you have a low-power (obsolete) computer, then select e17, Xfce or LXDE. They are untested. You can occur with issues while using them. ISO file can be downloaded either by direct link or via torrent. It is recommended to select the download via torrent. Before running it is strongly recommended to check the integrity of the downloaded file. If the file does not pass the integrity test, then it can not be used. 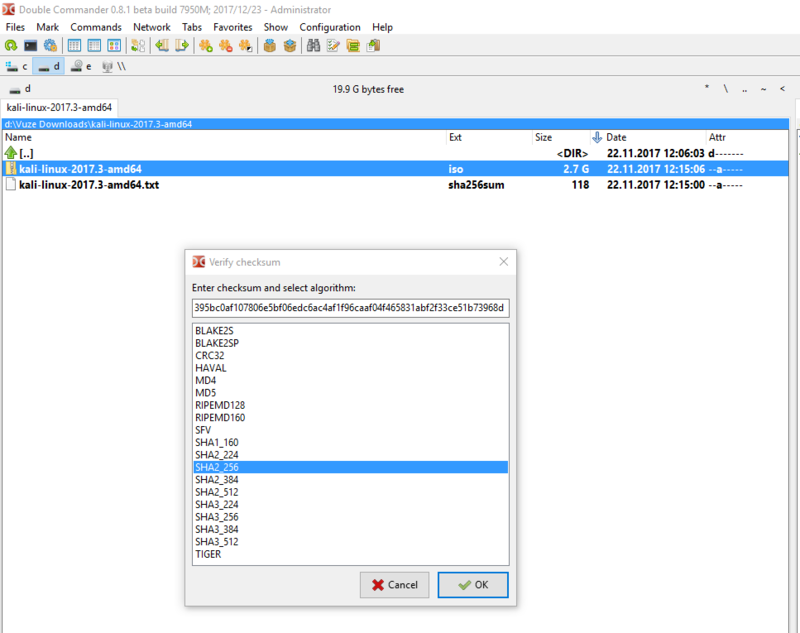 I'll show you how to check the integrity of the file using the Double Commander. On the official site, copy the checksum for the file that you downloaded. 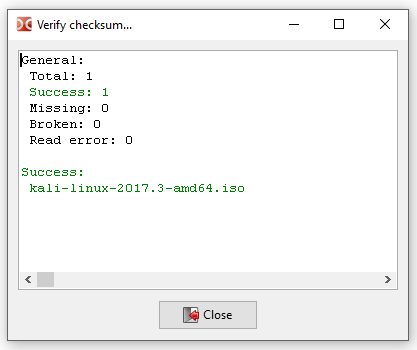 Wait until the end of the operation, if the checksum is correct, then it serves as confirmation of ISO authenticity.